Chiropractic is a science which focuses on the relationship between structure and function. Specifically, chiropractors make small, focused adjustments to the joints of the spine and extremities to improve function of these joints and influence the functioning of the nervous system, which controls just about every cell in your body. Chiropractors rely on the body’s natural ability to heal itself and work to facilitate and improve this power by improving the relationship between the skeletal, muscular and nervous systems of the body. Because of this unique relationship, chiropractic is used to treat a broad spectrum of conditions. 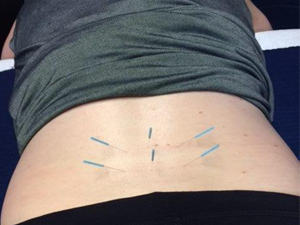 Acupuncture needles are inserted into motor points of affected muscles to help alleviate musculoskeletal pain syndromes where there is no obvious injury or inflammation. In these syndromes, the motor point of the muscle becomes over sensitized. IMS is a way to desensitize these motor points and give relief. Therapeutic massage is a technique involving manipulation of soft tissues of the body to render a therapeutic response. It can be used as a preventative or restorative protocol. Therapeutic massage helps alleviate soft tissue dysfunction and pain that can be caused by a variety of conditions. Copyright © 2015 Trinity Chiropractic and Laser Centre. All rights reserved.